Have you ever felt like you were falling off the edge of a cliff? This will be brief..... the picture describes completely where we feel we are at right now. If you are reading this on Thursday 7/31, then just to update you that our 6 month rental lease expires today, however the contract says we are able to automatically go month to month (the house is on the market for sale now). We have been looking for a "backup" place to rent, but there is nothing available. 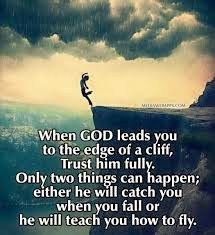 What believe that God is teaching us how to fly, that we are at the edge of the cliff. He is teaching how to trust Him at a much deeper level then we ever have before. There is absolutely nothing we can do except rely on Him and believe that He will make a way where there seems no way. We "sense" that He is working out the details for us to purchase a home/piece of property here in El Dorado Springs, MO. A few blogs ago, we wrote on the vision the Lord is giving us to open a retreat center/Bed & Breakfast or as I'm thinking Dinner & Dream (i don't like getting up early). A place we can offer to those who want to get away from the busy city life to slow down and hear from God. There is so much He is showing us that we will be involved in with this property and if you would like to know more, please feel free to email us. Each time we share the "vision", we are encouraged and get more and more confirmation. July 22, 2014: You can see a path of expansion before you. Don't obsess about expanding; rather, let Me use My word in and through you to establish a pathway that you will see and follow. Refuse to be in stress or try to control the progression or outcome. Watch and be amazed at how I will direct this great drama that will unfold before you. It will be a production that will be unforgettable. Be My instrument of divine purpose, says the Lord. & from a friend Dana Miller - "Fear not, for behold I am doing something in your day and in this hour that I were to tell you it would astonish you. Prepare to be astonished daughter. Do not limit me to a time and an hour. For when I move and when I speak, everything changes. Love you! Hang in there. It won't be much longer now. Wait.....and be astonished!" Would you please stand in prayer with us - believing for God to move the mountain....and open the doors that He wants open? Please pray for favor with our landlord and that month to month is a blessing for both him and us until these doors open. Thank YOU! We covet your prayers! 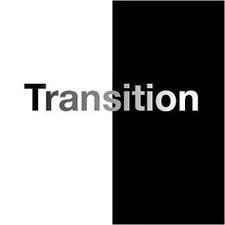 Transitioning Once Again - A Shift Is Coming! Last blog post I wrote briefly about a "shift" coming and that July would be a whirlwind month for many. Little did we know that we would be part of that shift. We have been in El Dorado Springs, MO six months now.. can you believe that? Our lease for the house we are staying in ends July 30th (Ken's birthday). The landlord had originally agreed that we could continue to renting month to month but that he would put house on market for sale August 1. The contract even says automatic month to month once lease expires. We spoke to him July 8th and he verbally confirmed this. However two days later he called and told us the house was SOLD!!!!!!!! (though we know it has not) OMG! 20 days to pack 2500 Sq ft, find a place to rent and move with 2 big dogs. Ha ha ha ha ha! Hysterical! If you were reading this blog November through February, you would remember that there is absolutely NOTHING available to rent in area that is doable. Most landlords don't take pets. Most of the rentals are not liveable and are way too small. However, we know God is faithful and He made a way in February for the house we are in.... and He will make another way. We have met loads and loads of people and are seeing God's hand of favor in relationships that are growing. There are many that are looking forward to the time when God releases us into our purposes there and we are excited for that too. We are standing in faith and believing for God's provision and continued guidance! He continues to encourage us with little nuggets (signs) that confirm we are in His will. Praise be to God! It was exciting connecting Joni Ames to so many new people and churches - opening doors of opportunity for her and us to minister alongside her! God is good! Please keep her in prayer as she recently lost her brother and has much added stresses to deal with. Warfare wages on!!! Slaying giants daily! Battle weary!!! But we know the end of the Book!!! Please be in prayer if you would.....for peace, reprieve from battle, unity, provision and always for my health. It continues to be what the enemy uses to beat me up! If we can be praying for you, please let us know! It is our delight to reciprocate!